Keane helps companies navigate the complex unclaimed property filing landscape and report unclaimed property correctly. Our goal is to assist you in achieving full compliance and avoiding serious fines and penalties. For the company that has not previously filed unclaimed property reports, completing a voluntary compliance filing is one method of reducing your audit risk. While no industry is “safe” from an unclaimed property audit, the benefits of a voluntary escheat filing can be significant in avoiding a situation of that nature. A voluntary unclaimed property filing, also known as a VDA, will allow your company to willingly come into full compliance while avoiding the fines and penalties associated with overdue filings. A VDA can also reduce the period for which your company is required to report on property. If your company has not previously filed a VDA in a particular state, you may have the opportunity to complete this process. If your organization has never been audited, the chances are now greater that it will be, given the current economic environment, as well as states becoming more consistent in their enforcement of unclaimed property regulations. Even if one or more states has already audited your company, that does not preclude additional states from doing the same.  A voluntary unclaimed property filing, however, can help improve your chances in terms of what the state might think you owe. Keane’s specialists will help you file by proactively identifying potential unclaimed property exposure, providing valuable guidance relating to those states that offer favorable incentives, preventing you from over-reporting, and assisting with implementation of advanced policies and procedures. Our consultants will work with you to create options for defensible estimation techniques and develop the necessary documentation required for effectively supporting voluntary unclaimed property filings with the states. In one instance, after reviewing the company’s books and records, Keane assisted management with filing a VDA that waived all applicable interest and penalties and provided significant savings given the limited reach-back a VDA achieves. In a second case, we learned that the client had unreported obligations in 49 states. The analysis identified more than $7 million in past-due property that carried a potential interest penalty of $17.4 million. Our consultants helped the firm structure and file multiple VDAs to avoid fines and penalties. The initial obligation was reduced by 83 percent. Even more valuable, however, was that the company avoided 81 percent of the potential interest penalties.